March 2, 2011---Deep in Indonesia, motion-activated cameras have recorded two critically endangered Javan rhinoceroses with their calves. Though the footage is "great news," only 40 individuals remain—with none in captivity, conservationists say. New video offers scientists encouraging evidence for the survival of critically endangered and rarely seen rhinoceroses in Indonesia. WWF recently released motion-activated camera video captured in the Ujung Kulon National Park on the island of Java. 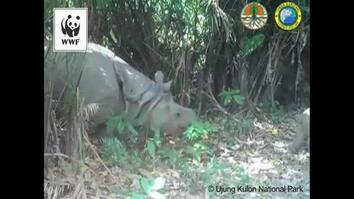 The first video shows a female Javan rhino with her male calf walking through the rain forest and munching on leaves. At one point, the calf turns away and wags its tail, possibly to swat a fly. WWF points out that the Javan rhino is one of the world’s rarest mammals, with as few as 40 left in the wild. None are in captivity. The confirmed population exists on the western tip of Java, in the national park. Its small, concentrated population size contributes to its vulnerability—any natural disaster could wipe out the remaining animals. In addition, because of its perceived medicinal qualities, the rhino remains a target of poachers. A Javan rhino was killed for its horn in 2010 in Vietnam. The second video shows a different female and her female calf of about one year of age. 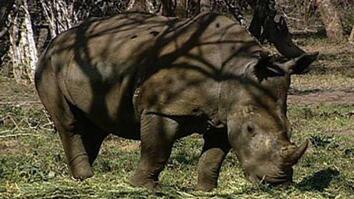 A WWF scientist says the videos are great news, and prove the rhinos are breeding in the park. Conservationists hope to protect the existing animals, and establish a new population through relocation. Africa’s Big Five Animals: What Are They? 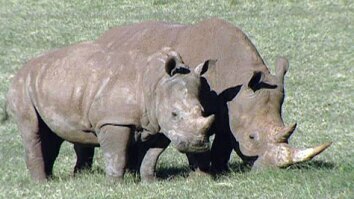 Is It OK to Trade in Rhino Horn? Could Safely Removing This Rhino’s Horn Save Its Life? Can You Save Rhinos By Selling Their Horns?